In our previous blog, we talked in-depth about the benefits that certain foods can provide your teeth; in reality, no food is entirely beneficial for your teeth, and only one beverage can claim that right: Drinking water. It should come as no surprise that water reigns supreme as the ultimate oral health-conscious substance, as water is life. It is thanks to water in our bodies and on the planet itself that we can enjoy life every single day; but the benefits don’t just stop at overall body health, as water itself is actually great for your mouth, teeth, and gums. Bar none, water is the best possible thing you can drink. Any and every other drink, even slightly altered water, is, at best, less harmful for your mouth. When you drink water, you’re actually helping to rinse away any particles that may be clinging to your teeth and gums without leaving any new ones behind, as juice, soda, coffee, and other beverages will. Water also typically has a perfect balance of pH, meaning that it does not contain harmful acidic properties, as most other beverages are. So, you get all the benefits of a rush of liquid in your mouth without the lingering bacteria, acids, and sugars that other beverages contain. In spite of what you may see shared on social media, there is an overwhelming amount of evidence in support of the widespread fluoridation of our water supply. In fact, the fluoridation of the US water supply is widely considered among the greatest achievements of the 20th century, right up there with the polio vaccine, the creation of the internet, and the development of modern medicine. In case you’re unaware what this means, fluoridation is essentially just infusing and balancing the level of fluoride in our water to be slightly higher than it would be otherwise, which is then absorbed by your body (and teeth). To put this benefit in perspective: If you’re over 28 and have more than 5 teeth, that is in large part thanks to the introduction of fluoride into drinking water and toothpaste alike. There is, right now, more individual bacteria in your mouth than there are people in the world. The first line of defense between these bacterial cells and the teeth and gums floating around in them is your saliva, which has tremendous anti-plaque and anti-cavity properties and generally keeps particles from attaching themselves to your teeth in the form of tartar. 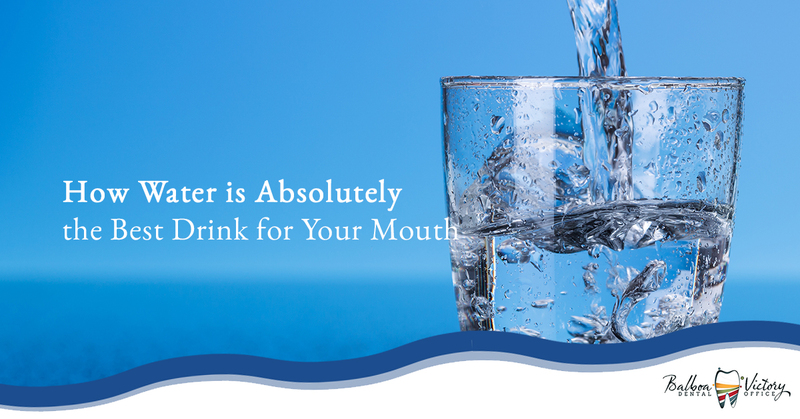 Water is one of the few substances that promotes saliva production and fights against dry mouth. This shouldn’t come as a surprise to anyone that has done sports or worked out, as nothing in the world tastes better than water when you’re absolutely parched. Water doesn’t just offer one of these amazing benefits, but all of them simultaneously. With a single drink of water, you wash away bacteria and food particles, help to correct your mouth’s pH balance, get a healthy dose of tooth-strengthening fluoride, and promote saliva production to continue the effect for hours to come. Plus, if that’s not enough, water is just plain old healthy for your body, which is good for your mouth as a part of the larger whole. Drinking water is so incredibly good for you that nothing else comes even close to comparing with its dizzying array of benefits. If you drink water regularly, brush in the morning and evening, and visit your dentist for routine appointments, your teeth and gums are exponentially more likely to stay with you throughout your life – yes, it’s that important! Contact us today for appointment information and availability!